Although we are cutting it close, we do believe we are almost ready to leave here in the AM. We have worked furiously getting the boat straightened inside enough to sail. Muzza will come in the morning at 8:30 to make the last adjustments to the new cockpit enclosure and Luck will come at 9:00 to rub out our first little gouge in the new paint. It is in the green stripe right below where the dinghy engine hangs, so we assume it happened when hoisting the engine. It is not big, but Luck wanted to fix it before we leave. I have to go to the office to pay our bill in the morning and then hopefully by 9:30 we will leave here with the tide. It takes about an hour to drive through the mangroves in shallow water to reach deeper water in the bay and then we head straight for Phi Phi Le. It is one of our favorite spots in Thailand and we hope to just sit back and enjoy the evening there before continuing on the next morning. We ended the day by inviting a few of our boatyard friends over to Windbird for a farewell celebration. Richard and Susan of Sea Bunny, Ley of Crystal Blues, and Larry and Joe came and then we all went to dinner at the little Asia CafÃ© here in the Lagoon. It was a fun evening and a nice way to end our time here. Oh soooo very slowly we are making progress. The inside of the boat is beginning to look livable and maybe one more day will do the trick. During the early part of the day, Larry came over to see if we needed help. Larry is from Michigan but lived in the lakes region of New Hampshire before starting his trip around the world. He crossed the Atlantic and spent time in the Mediterranean before crossing the Indian Ocean from west to east and has been here for almost a year working in the East Marine Chandlery here at the Boat Lagoon. He has been a source of constant information for us and has become a friend. So he tailed the line for Mark to climb the mast this morning which freed me up to work on the inside of the boat to try and put things away. In the small confines of a sailboat, each and every thing has its place and it seemed like everything we own was just piled in the main cabin. At the end of the day, there is still much to do, but we’ll go at it again the morning. 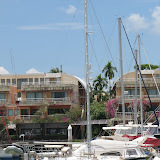 It was almost noon when Mark and Larry were finished with the mast work and we joined Ley of Crystal Blues for lunch. Then Ley took me food shopping for meat and fresh fruit and veggies. We just need enough for the next eight days, so the shopping trip was quick and it was back to work on the boat. At about 6 pm Larry called to have us come over to E Dock. He was moving his boat with the late evening high tide to a new location. We no sooner got the dock lines attached when a huge rain storm descended upon us. 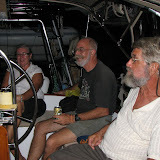 We hopped into Larry’s boat to wait out the storm with Larry and Joe, a young friend of his visiting from the US. We had a couple of beers and still the rain was pouring down, so we finally had to brave the storm and walk to dinner in the rain. Larry and Joe came back to Windbird after dinner and we talked until midnight. Larry is a pilot for Delta but due to tight financial times, they are giving their pilots leaves of absence if they choose. Joe is taking advantage of that and is spending a lot of time traveling the world. This is his second trip to Southeast Asia in the past six months and his next planned trip is an African Safari from Johannesburg to the Serengeti. Last year he traveled in New Zealand and we spent a lot of time talking about that. Tomorrow Muzza comes with the final installments of canvas for the cockpit enclosure and David Samuelson, the rigger, is hopefully coming to help Mark adjust the rigging. I know the day will go quickly and then on Tuesday morning we will leave the Boat Lagoon with the morning high tide. I’m sure we will be working all the way to Langkawi getting bits and pieces stored away and then we get to start packing and getting the boat ready to leave. I think I’ll enjoy the long plane ride home with nothing to do but sleep and read. In fact, I know I’ll enjoy that. This is a big month for our son Justin and his wife Jo. They were married two years ago and in the next couple of weeks they will become parents. Â Â So congratulations to you, Justin and Jo. We are so happy for you and can’t wait to arrive in New Mexico for the birth. We are still juggling work crews and haven’t had a chance to straighten out the inside of Windbird. So we are still in the apartment tonight. We should be sleeping on Windbird by tomorrow night-at least that is our hope. Oh’s crew finished their work in the cockpit today, Nop’s crew added an extension bar for our grill, and Muzza installed the dodger. The remainder of the canvas will be installed on Monday and hopefully that will be end of the work crews. We really need to get ready to leave on Tuesday morning. Since tomorrow is Sunday and no one works, we should have Windbird to ourselves and be able to get things together. We have just been moving so fast that we can’t keep up with ourselves, but we’re hoping tomorrow will give us the time to get things in order. This was our first full day in the water and it was a crazy, busy day. In the early morning I stayed in the apartment and worked on getting photos ready to upload to the website and at the same time, get photos ready to give to Oh. Mark went to the boat to organize the work crews. Oh’s crew was back to do some finishing work in the cockpit and Marine Electronics were there to work on our inverter/transformer problems that developed when we moved from land to water. At 9:30 am Mark and I headed to Ao Chalong to check out of Thailand. Unfortunately, we forgot that we were told that the rental jeep was absolutely empty of fuel and we left Boat Lagoon without getting fuel. We realized this just after leaving, but the fuel stations here are far apart and we ran out of gas before we reached a station. Fortunately, an older Thai gentleman on a motorbike saw our problem and came to drive Mark to the gas station and back. He wanted no money for his services, but I insisted on given him a token fee. We were only delayed about 20 minutes, so we still arrived in Ao Chalong well before noon to do the check-out process. That went smoothly and afterwards we had lunch with Gerry and Donna of Scot Free II. They are planning on leaving Ao Chalong tomorrow or Sunday and heading for Phi Phi Le where they will wait for us to arrive late on Tuesday afternoon. Getting out of here by Tuesday morning seems more challenging that we had thought, but that is still our goal. The cockpit enclosure is still not on the boat and won’t be until Monday. The dodger will be put on tomorrow, but the side curtains just aren’t ready. We did get the inverter/transformer issue worked out today . . . we think. Oh’s crew will finish their work tomorrow, so if all goes as planned we should make our Tuesday morning deadline. We are hoping to move out of the apartment tomorrow morning, but it is possible that we won’t make that deadline. We could still be here until the next day just because it is so difficult to move things back to Windbird with work crews still there. The greatest thing about today was our end-of-the-day celebration with Oh and his crew. We went up to a small cafÃ© and had a great ‘happy hour’ celebration. We have grown so fond of Oh and his crew. They have done an incredible job and have taught us so much. Oh turned 34 in January, Luck (or Lux as we learned this evening) is the youngest member of team, Pong is actually a little older than Oh and has been painting longer than Oh, and Lok (Lot, as we learned tonight) is the newest member of the team. This is just one of Oh’s six teams. I don’t know if the other teams are as good, but this team ROCKS. Oh, Luck, and Pong are Buddhist but Lot is Muslim. We learned tonight that Oh’s partner, Beei, is also Muslim. She doesn’t always wear a head covering, but she is devout. Oh explained that there is always a bit of tension between the Buddhist way and the Muslim way, but he and Beei make a great couple and will work things out. The thing we are most impressed with is Oh’s Buddhist thinking about a job well done. Having a beautiful product is the most important thing for him. And we think we have one his most beautiful products. Windbird looks great and is ready to sail south. 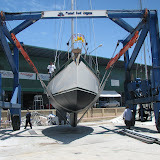 Windbird is back in the water and securely tied to the B dock at Boat Lagoon. The day didn’t go exactly as planned but it went smoothly. We arrived at the boat just after 8 am and were told by Luck that the travel lift was arriving in just a few minutes to lift us so that we could paint the bottom parts that had been under the pads. We thought this was happening at 2 pm so we were a bit shocked but ready to go. The yard manager, Mr. Sin, is very efficient and very good, but you don’t argue with his decisions. As soon as we were in the slings, we were then told that we would be in the water at 1 pm, not 3 pm. So we all adjusted our time schedules to be ready. At exactly 1:08 pm the action started. Mark and Luck were on the boat with Oh, Pong, Lok, and myself on the ground. I walked around to the launch area. Earlier in the day I had taken a taxi to the local market to buy good luck flowers to hang on the bow sprit, and Patti on Equus had given us good luck fire crackers to be lit just as the boat hit the water. I hung the flowers on the front of the boat and made sure there was someone in charge of the fire crackers. We had one little glitch as they were bringing the boat out hard stand area. There are concrete cones separating the road from the hardstand area. As Windbird was being brought out of the hardstand area, the lift hit one of the concrete cones and everything came to a standstill. There were lots of shouts but no damage, so the things continued on. From that point on things went smoothly. Windbird went into the water with the sound of 250 fire crackers going off. The man setting off the firecrackers came to me with a ribbon with the number 888. He said we had a very lucky number, so I will keep that ribbon and hope that he is right. Four is my lucky number so I figure 888 is 4+4+4+4+4+4+4+4. Sounds lucky to me. Mark and Luck moved the boat across the marina to B2, our new home for the next few days. Once we were settled in, the weather decided to let loose and we had another Thailand deluge. Just before the heavens opened, we were able to put up a tarp so some work could be continued. We had hoped to have a celebration with Oh and crew but the weather and other circumstances curbed that. Pong got a call from his wife telling him that his daughter had been taken to the hospital. Oh left with Pong and we will have to wait until tomorrow to hopefully hear that Pong’s daughter is fine. Luck and Lok stayed onboard to do some of the ‘finishing touches’ and Mark and I worked to get the inside of Windbird a little more organized. We had to call Marine Electronics, the company that installed our new transformer to come check things out. The transformer worked great on the hard, but when we plugged into the dock, we got no power. Marine Electronics responded unbelievably quickly but they are not sure what the problem might be. Mark thinks it has to do with grounding issue, but the investigation of that problem will be continued tomorrow. Mark and I will head to Ao Chalong tomorrow to check out of Thailand and spend the weekend making sure we are ready to leave here on Tuesday morning. We have the weekend and Monday’s Chinese holiday in which to get ready, but we do think we will be fully ready to leave here on Tuesday morning. We have been in phone contact with Gerry and Donna of Scot Free II and think we will be traveling back to Malaysia in their company. Instead of leaving here and doing an overnight straight for Langkawil we will do day-hops. We will arrive in Langkawi next Friday instead of on Wednesday, but with all the fishing lines and traps between here and there, this sounds like a much safer route. So the day was spent preparing to raise the mast. All the hardware was installed, lines were run, wiring was ready to feed into the boat. The crane arrived promptly at 2:00 and we all flew into action. 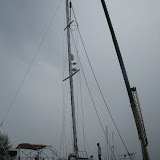 The mast was connected to the crane and hoisted into position over the mast base on the cabin top. Then it all went to hell in a hand-basket. The crane jerked, the mast dropped a couple feet, it struck the deck and the nice new paint job was destroyed with massive gashed across the deck. It would take weeks to repair. We were devastated — then we realized what day it was. April Fools!!!!! So April’s Fools aside, we actually we had a terrific day. In an unbelievable four and a half days we got the mast and boom ready to be raised. At exactly 2 pm the crane arrived and at exactly the same time, the afternoon rains arrived. So in driving rain, Oh and his crew, along with Mark and I, got the mast stepped. We had a few problems and things didn’t go as smoothly as we had hoped, but the job is done and we are now ready to splash. If things continue to go as planned, we will be in the water by late tomorrow afternoon, so tomorrow night’s log might be from a Windbird back in the water.